Well most people around me have been saying they don’t like Valentines Day… but I love it. And I don’t mean that it’s a day I expect romance and flowers and crazy dinners but I do think its lovely that people set aside a day to celebrate their loved one. How many days in the year do we set aside time to think about that? Or to just tell them how you feel? I hear too often people saying “they don’t need a day” or a “special day” to say these things…but I also know too well that most people don’t say it enough! :) So why not? Besides, we hear so many sad stories that it is nice to hear “Happy whatever Day!” as often as we can. In any case, I am glad that I do have Josh and my family and friends. Despite some overwhelming losses this year I also am glad to set aside a special day for Love. 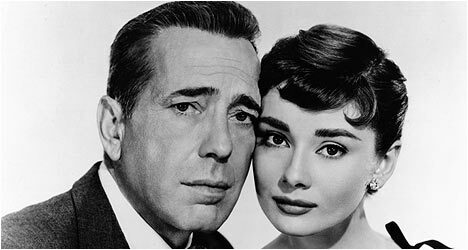 Sorry to be so cheesey but I just watched Sabrina and it makes me think about Audrey Hepburn and how lovely she was… and about Josh… how young she was! And how childish her crush was at the beginning of the movie! Do you remember your first crush? I am so happy to remember all the crazy childish and funny ways we were and how happy we still are! I also wish that we still made movies like this… Josh and I agreed that Billy Wilder was amazing. And we love these movies more than any other kind. For some reason we always have. I feel like the stories weren’t over the top or needing crazy special effects… just real people and situations.. and wit and a sense of humor mixed with real meaning. Although I admit I am a bit excited to about the new Red Riding Hood! Anyway I had better get to bed.